I work in a department that pretty much requires you to be a geek of some sort. So with the release of The Hunger Games comes some angry crys of fans of Battle Royale. What is Battle Royale? I had no idea until my co-workers filled me in. Written in 1999 by Koushun Takami the novel is about an alternate timeline where Japan is part of the Republic of Greater East Asia. They kidnap 9th grade kids, take them to an Island, then provide them a pack that has one random weapon and food rations. The kids then must fight to death killing not just other kids, but their best friends and girlfriends/boyfriends. They have to wear these collars that track them and have a mic in them so that the people in charge of the whole thing know what they are doing. They also have zones that if you are caught in the wrong one at the wrong time your collar will blow up which is how they shrink the playing field. That way the kids are forced to fight each other if they are not willing. There is also a movie and a manga based off the book and if you search the two things on google you will find there is no shortage of gore. I'm not one to compare one thing to the other. The Hunger Games is The Hunger Games and Battle Royale is most certainly Battle Royale. They obviously have similarities but they are still their own books. I think I might check out the Battle Royale book but I'm probably going to pass on the movie....looks a little out of control in the gore department. I actually love Battle Royale and I've seen it a few times now. I would argue that BR is a bit more shocking than the HG because all the kids involved are friends and they don't live in a society that's numbed them to violence. At the same time, HG televises the bloodbath and basically does it for show, which is horrible. I think there are a lot of similarities, to the point where if Suzanne Collins read BR or saw the movie, she would have tried to change some things about HG to avoid the similarity. Honestly, I love them both. Ya I think the idea of forcing the kids to kill people they know and are close is more intense. Not that kids killing each other isn't intense in any circumstance. 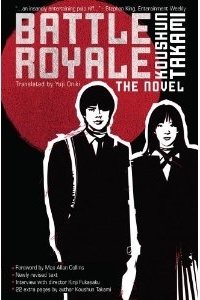 One of my co-workers actually was wondering if Suzanne Collins had ever read Battle Royale.